Wrought iron stair railings are among the most popular types of stair rails used across the country. As such, they remain a versatile, dependable option for residential and commercial properties of any style and décor, not to mention their elegant, graceful appearance becomes more attractive with time. Given their resistance to weather, wrought iron stair railings were originally installed as spiral staircases in tall buildings and lighthouses. Over time, home and business owners requested various styles of wrought iron railings, as the material not only promoted safety for occupants, it enhanced the interior and exterior surroundings. In turn, the wrought iron proved highly durable, resistant to vibration and shock, and it could be molded into many shapes—without compromising its strength. Today, wrought iron stair railings continue to be “on trend,” with designs ranging from simple and traditional to ornate and contemporary. With virtually no limits to the style of wrought iron stair railings, homeowners and businesses have the freedom to be as creative as they wish. Even more important, they can be assured of the safety and security of those on their property. To better understand, every stair railing is subject to specific building codes and regulations, and railings are necessary to prevent accidents such as slips and falls. Yet, railings composed of wrought iron are both functional and safe. Though they are a greater investment when compared to other materials, they are not susceptible to breakdown, and can last a very long time. With genuine components, powder coated finishes and color combinations, wrought iron stair railings are a sleek, high value solution for indoor and outdoor spaces. As a distinguishing element of a staircase, wrought iron adds enormous curb appeal to one’s home or commercial property. 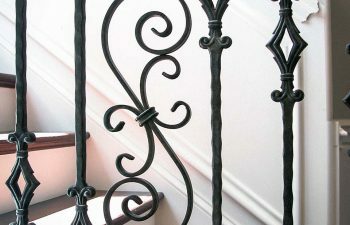 The team of artisan welders at Southern Staircase/Artistic Stairs has developed an outstanding reputation for beautiful and timeless wrought iron stair railings. In regards to quality and aesthetics, our services are unparalleled from Beverly Hills to Boston, as we’ve provided the finest iron handrails for residential and commercial applications across the country.From inspiration to installation, our clients can expect a seamless, turn-key process. Working collaboratively, we take the time to get to know our clients, so as to create a one-of-a-kind work of art that translates their unique vision and style. Meanwhile, we remain vigilant to the needs of our clients in regards to time and budget by including multiple options for their staircase project. To discuss your staircase design project, please call the team at Southern Staircase/Artistic Stairs today!